The Poland–Czechoslovakia war, also known mostly in Czech sources as the Seven-day war (Czech: Sedmidenní válka) was a military confrontation between Czechoslovakia and Poland over the territory of Cieszyn Silesia in 1919. The Czechoslovak government in Prague requested that the Poles cease their preparations for elections to the Polish Sejm in the area that had been designated Polish in the interim agreement as no sovereign rule was to be executed in the disputed areas. The Polish government declined and Czechoslovak units attacked the Polish part of Cieszyn Silesia to prevent the elections in the contested territory. The attack was halted under pressure from the Entente. The result of the war was the new demarcation line, which expanded the territory controlled by Czechoslovakia. It led to the division of the region of Cieszyn Silesia in July 1920, and left a substantial Polish minority in Czechoslovakia in the region later called Zaolzie. The division of Cieszyn Silesia did not satisfy Poland and led to the Polish annexation of Zaolzie in 1938. During the final months of World War I, Polish and Czechoslovak diplomats met to hammer out a common border between the two new countries. By the time the armistice was declared, most of the border was worked out except for three small politically sensitive areas in Upper Silesia and Upper Hungary which were claimed by both countries. Cieszyn Silesia or the Duchy of Teschen (Polish: Cieszyn and Czech: Těšín) was a small area in south-eastern Silesia. The last Austrian census of 1910 (determining nationality according to the main communication language (German: Umgangssprache) of the respondents) showed that it was predominantly Polish-speaking in three districts (Cieszyn, Bielsko, and Fryštát) and mainly Czech-speaking in the fourth district of Frýdek. The city of Cieszyn itself was mainly German-speaking. Part of the population (the Ślązakowcy) claimed a distinct, Silesian identity. The chief importance of Cieszyn Silesia was the rich coal basin around Karviná and the valuable Košice-Bohumín Railway line which linked the Czech lands with Slovakia. Furthermore, in north-western Cieszyn Silesia the railroad junction of Bohumín served as a crossroad for international transport and communications. 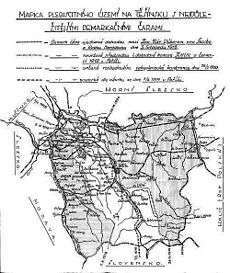 On 5 November 1918, the Polish National Council and the Czechoslovak Committee concluded an agreement on the demarcation line for administrative and military purposes, and divided the area along the ethnic boundaries. The Frýdek district and a small part of the Fryštát district was left on the Czech side, the remainder was accorded to the Poles. The Czechoslovak side was led by Josef Šnejdárek. Czechoslovak military forces had been formed from the three legionary batallions of the 21st Shooting Regiment from France, the 54th infantry batallion of Olomouc, the 93rd infantry batallion of Fryštát, a volunteer batallion from Bohumín and a volunteer batllion from Orlová. The operations of the Czechoslovak forces were joined by other local volunteers, formed in the National Guard approximately 5,000 men strong. From the north-west of Slovakia came the main force that was sent to support the 35th Legionary Regiment from Italy, led by the Italian Colonel Graselli and later reinforced with the Shooting Legion Regiment from Italy. During the war the Czechoslovak army was reinforced by the newly formed 2nd Brigade with a strength of six battalions, with the support of two artillery batteries, and one cavalry squadron. The Czechoslovak army was further strengthened by the 1st Batallion of the 28th Infantry Regiment, 1st Btn. of the 3rd Infantry Reg., 2nd Btn of the 93rd Infantry Reg. and 5 volunteer batallions. Polish forces under the command of Franciszek Latinik were weaker than the Czechoslovak forces. At the end of World War I, Poland was fighting in border disputes with all its neighbors, and during the war with Czechoslovakia the main force was committed to the fighting in Eastern Galicia with the Ukrainians. The Polish forces were composed of five infantry battalions supported by four machine gun companies, a cavalry platoon and an artillery battery. Other forces included approximately 550 members of the gendarmerie and around 6,500 local Polish volunteers. Polish forces were reinforced during the war. On 23 January 1919 at 11:00 in Cieszyn Silesia Polish commander Franciszek Latinik and Czechoslovak officer Josef Šnejdárek met with a group of officers, consisting of English, French, Italian and U.S. representatives (at the request of the Czechoslovak party). The Polish side was given an ultimatum, that they evacuate the area to the Biała River in less than two hours. After the expiry of this period the Czechoslovak army started its operations at 13:00 following its operational guidelines to seize Bohumín and Karviná. From the east, at the same time, an attack was launched by the Italian legionnaire unit. The Czechoslovak army moved forward, and took Bohumín (at 16:00), Orlová and Karviná. Cieszyn Silesia was occupied without a fight on 27 January 1919. Polish troops retreated to the river Vistula. On 30 January 1919 Josef Šnejdárek received the order to cross the Vistula and secure the railway line between Bohumín and Jablunkov. They crossed the river and the Polish troops retreated to Skoczów, where the front line was stalled. Further Czechoslovak reinforcements arrived, which gave Šnejdárek an advantage over the Polish units. The Czechoslovak army prepared for an attack on Skoczów assuming that it would lead to the collapse of the Polish defenses. On 31 January 1919, because of the pressure from the Triple Entente representatives, the attack on Skoczów was cancelled, and the Czechoslovak army ceased fighting. The Czechoslovak army withdrew to the new Green Line, established by the International Commission Agreement on the basis of the Czechoslovak–Polish Treaty, concluded on 3 February 1919 in Paris. The disputed territory was placed under international control. 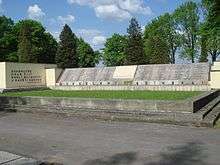 The final division of Cieszyn Silesia came in July 1920 as a result of the Spa Conference. In conclusion, the railway line connecting the Czech lands with Slovakia and the territory to the south of it were assigned to Czechoslovakia, while the territory north of the railway line was assigned to Poland. In precise terms, Poland was assigned one-third of the population (142,000 out of 435,000), less than half of the territory (1002 km2. out of 2222), and the town of Cieszyn. Czechoslovakia received the districts of Fryštát and Frýdek, most of the area of the district of Cieszyn, the railway station of Cieszyn, Karviná and coal mines, Třinec with ironworks, and the whole Bohumin-Jablunkov railway line. Some 140,000 Poles were left on the Czech side. ↑ Gawrecká, 23, in particular the quotation of Dąbrowski: "Czesi uderzyli na nas kilka dni przed 26 stycznia 1919, w którym to dniu miały się odbyć wybory do Sejmu w Warszawie. Nie chcieli bowiem między innemi dopuścić do przeprowadzenia tych wyborów, któreby były wykazały bez wszelkiej presyi i agitacyi, że Śląsk jest polskim.". ↑ Wandycz, Piotr S. France and her Eastern Allies, 1919–1925: French-Czechoslovak-Polish Relations from the Paris Peace Conference in Locarno (January 1, 1962 ed.). University of Minnesota Press; Minnesota Archive Editions edition. pp. 75, 158. ISBN 0-8166-5886-2. 1 2 3 William Fiddian Reddaway. The Cambridge History of Poland, Vol 2. Cambridge University Press. 1971. pp. 513-514. ↑ Pogonowski, Iwo Cyprian. Poland: A Historical Atlas (March 1989 ed.). Hippocrene Books; Revised edition. p. 321. ISBN 0-87052-282-5. Feb. 3, 1919 Signing in Paris of Polish-Czech border agreement on the basis of the Nov. 5, 1918, ethnic division agreement. Davies, Norman. Polsko. Dějiny národa ve středu Evropy. Praha : Prostor, 2003. ISBN 80-7260-083-4. Gawrecki, Dan. Studie o Těšínsku 15. Politické a národnostní poměry v Těšínském Slezsku 1918–1938. Český Těšín : Muzeum Těšínska, 1999. ISBN 978-80-902355-4-0.